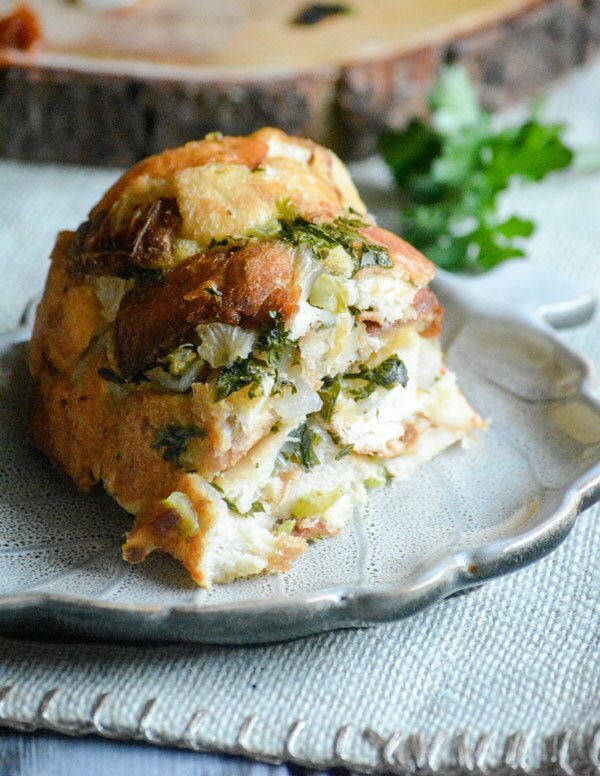 Stuffing is a quintessential side dish this time of year, although I still have to get my fix throughout the year. Which is why you’re almost always guaranteed to find at least 3 or 4 boxes of the boxed kind in my pantry, any time of the year. I don’t really crave, or need, the traditional turkey except during the Winter Holidays. That doesn’t mean you won’t find me enjoying a serious helping of our Crockpot Chicken & Stuffing, or a big ol’ slice of my Stove Top Stuffing Mix Meatloaf any time of the year. Years ago you’d have found me prepping, and of course ‘froofing’, a box of the stuff to set out on my dinner table. At the time it was good enough, and in a pinch- the box stuff still does the trick. But it’s no longer good enough for me, or my table. Especially not for my holiday dinners, like Thanksgiving & Christmas. Homemade is the only way I’ll go from now on. However you want to do it, whatever recipe you use, pretty sure you can’t go wrong as long as it’s made from scratch, and served with love. My guys tend to rap about my more extravagant efforts, such as this Ciabatta & Meatball Italian-Style Stuffing and my Mid-Atlantic Seafood Stuffing. I on the other hand, like to keep things simple. Traditional stuffing ingredients are my go to for our regular affair. I tend to spice things up if I’m bringing you guys a new recipe though, and step out of my comfort zone. 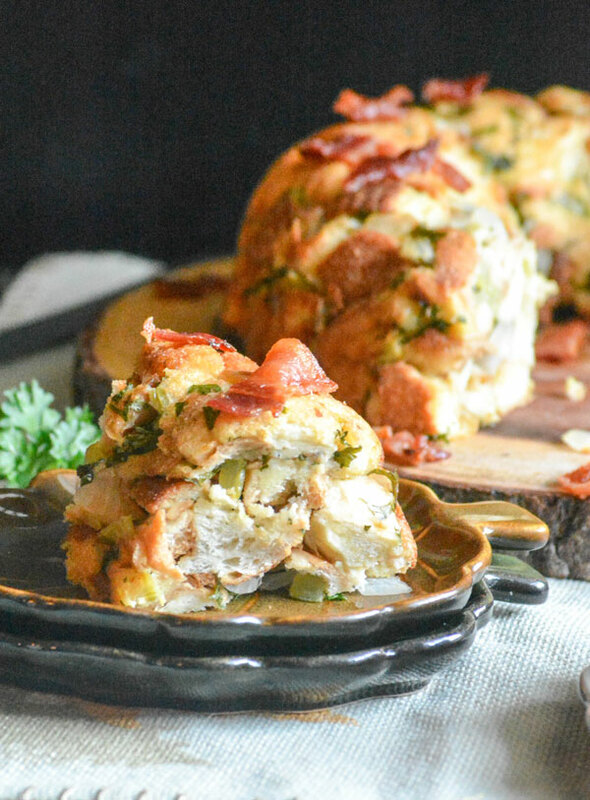 This Savory Bundt Pan Stuffing delivers, and has all the traditional ingredients of the Southern staple- but with a few modern touches on my part. Y’all know I live to put a new spin on a classic dish. I’m just doing what I do best here, lol. Three things that I’ve found in my kitchen adventures in particular come into pay in this recipe though. The first? Something as simple as a different presentation, can make all the difference in how well a dish is received and enjoyed. I mean, let’s be honest, stuffing’s almost always a winner either way. Change it up though and serve it as pretty upright dish on a woodsy cutting board? Everybody’s gonna be a bit more interested. The second goes hand in hand with the first. While I grew up eating stuffing cooked in the bird, and served directly from it- it’s technically taking a gamble. The reason being, the bread laden side soaks up all of the turkey’s juices, which can carry salmonella and other bacteria. In order to cook the stuffing to a degree that’s considered 100 % safe to eat, you’d generally have to overcook the bird. I don’t generally enjoy dry turkey, and who does? I also don’t want to take that chance, but no judgement if you choose to. I’m still alive 32 years later, and that’s how my Grandma & Mama have always done it. So, if you’re following us down this road, you’re looking to cook your stuffing outside the bird. Our family’s always cooked the extras that won’t fit in the cavity in a small casserole dish. They tasted good, but still ended up looking like an unappetizing pile of brown mush with mystery lumps. 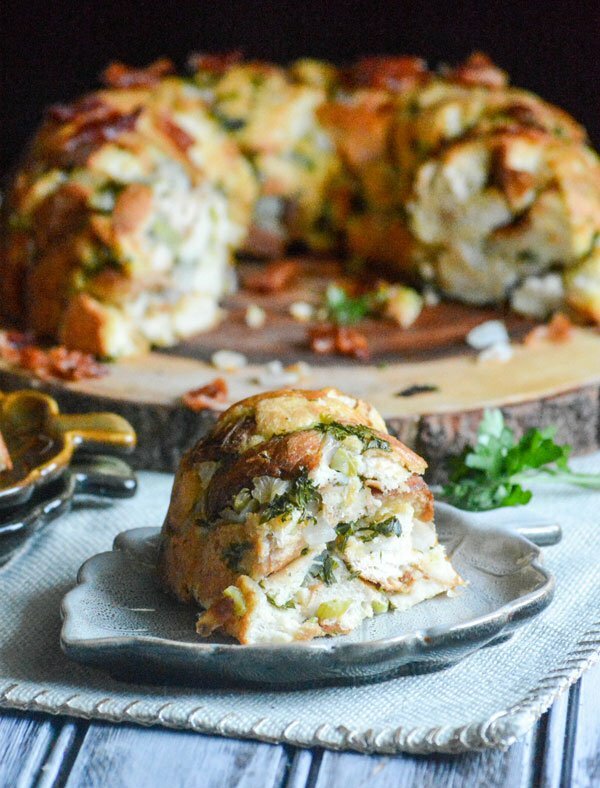 <Stage Curtains Lifting and a voice over head says, “And that’s where this Savory Bundt Pan Stuffing swoops in & saves the day.”> Two birds, err problems solved, with one stone. Well actually, with a single bundt pan as the recipe would have it. That third thing I was referring to? Well that would be bacon, and the fact that bacon makes everything better. 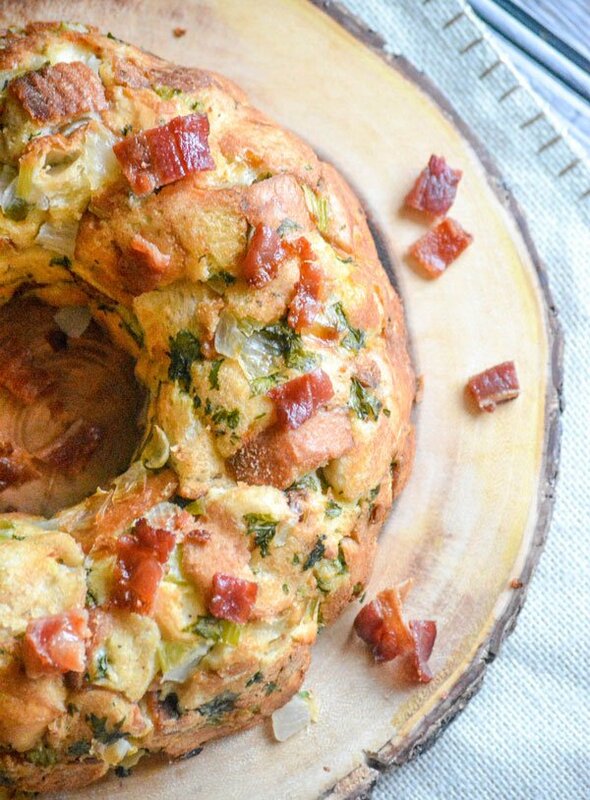 Bacon & bread are always a winning combination, making it an ideal addition to stuffing- especially this actual bread laden, from scratch version. Don’t let the from scratch aspect scare you, I promise you it’s surprisingly simple. Let’s talk about that! For this dish, you melt butter in a skillet and then stir in chopped onions and celery, cooking just until tender. They’re added to a large mixing bowl, along with savory seasonings, fresh parsley leaves, browned baked cubes of French bread, beaten eggs, crisp crumbled bacon, and a single cup of chicken broth. The mixture’s stirred together well, to ensure everything’s evenly incorporated. This mixture’s then pressed firmly & evenly into a liberally buttered, prepared bundt pan. 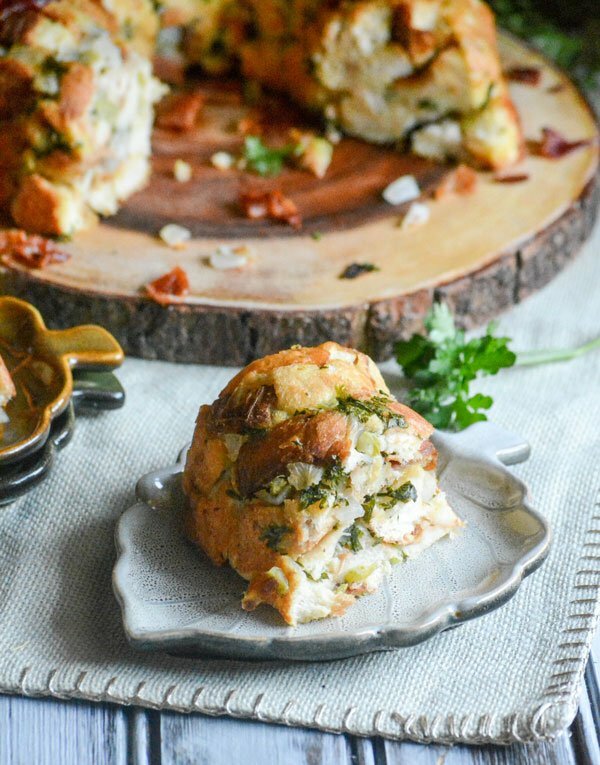 The Savory Bundt Pan Stuffing is then baked at 350 degrees, until cooked through and the stuffing’s a gorgeous golden brown. After a brief rest, the dish is turned out onto a pretty serving plate or circular cutting board for presentation. Sprinkled with extra crisp, crumbled bacon, it’s sliced and served. It’s a dish as delicious to taste, as it is to see on the family table. 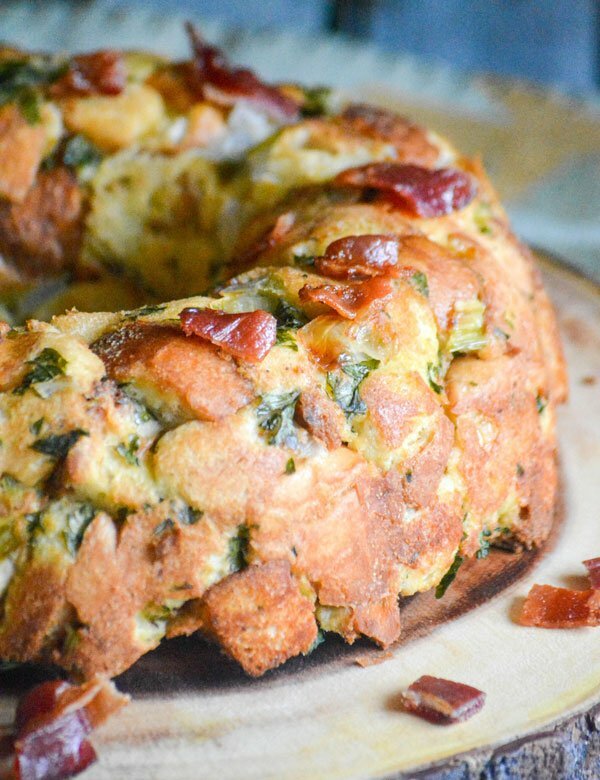 Don’t turn to the dark side, err the boxed side this Holiday season- skip that and give this Savory Bundt Pan Stuffing a try instead. Whatever your level of cooking experience, this will be a win for you, and you won’t ever want to look back. 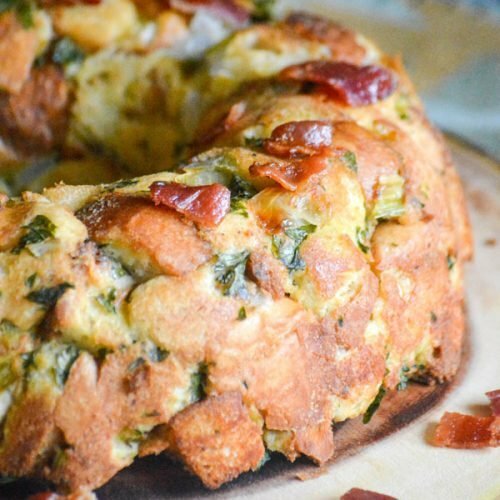 A delicious recipe for a traditional homemade stuffing, but this one feature's crisp, crumbled bacon & is cooked and served in a bundt pan for a presentation that will 'wow' your guests. Spread the bread crumbs out onto a flat baking sheet in a single layer. Bake the bread crumbs at 400 degrees, for 10 minutes or until lightly golden brown. Set aside, and reduce the oven temp to 350 degrees. Melt the butter in a medium sauce pan over medium heat. Stir in the onion and celery, and continue cooking about 5 minutes, or until they're tender. Transfer the cooked veggies to a large mixing bowl. Add the parsley leaves, thyme, garlic, and salt and pepper, as desired. Stir the spices into the veggie mixture. Next add the bread crumbs, eggs, stock, & half the bacon- stirring until everything's evenly incorporated. Use butter to butter the bundt pan, making sure to coat every bit inside to ensure the cooked stuffing slides out easily. Then transfer the stuffing to the prepared dish, and press the stuffing into the dish to pack it down evenly all the way around. Bake the stuffing at 350 degrees for 25-30 minutes, or until the dish comes out golden brown. Let the stuffing rest for 5 minutes, then run a butter knife around the edges to release the stuffing from the pan. Place a plate or a cutting board over the open part of the bundt plan, and holding them together tightly- flip the bundt pan to release the stuffing onto the dish. Sprinkle the rest of the bacon evenly out over the top of the stuffing. Serve & enjoy! This was so simple and DELICIOUS!!! I made it yesterday for the family Thanksgiving, and am making it again for Friendsgiving tomorrow. Love the idea in the bundt pan and slicing portions. Definitely going to be the annual recipe going forward! Thank you!